With the new design, we select turquoise blue as the dominant color instead of dark blue & orange red as before. We choose turquoise blue since this color is associated with meanings of refreshing, sophisticated, creativity, and intuition. Also, we add block How to help you give a quick explanation about the main workflow in your website. Other blocks such as freelance, project, service, and testimonial are re-designed to be cleaner and more intuitive as well. In this new version of FreelanceEngine 1.8, we will design a new page where stores all notifications, helping user to easily track and manage the notification. Along with homepage, other pages such as post project, project listing, profile listing, and signup/login are displayed with the new appearance as well. We hope all of you love this new design. 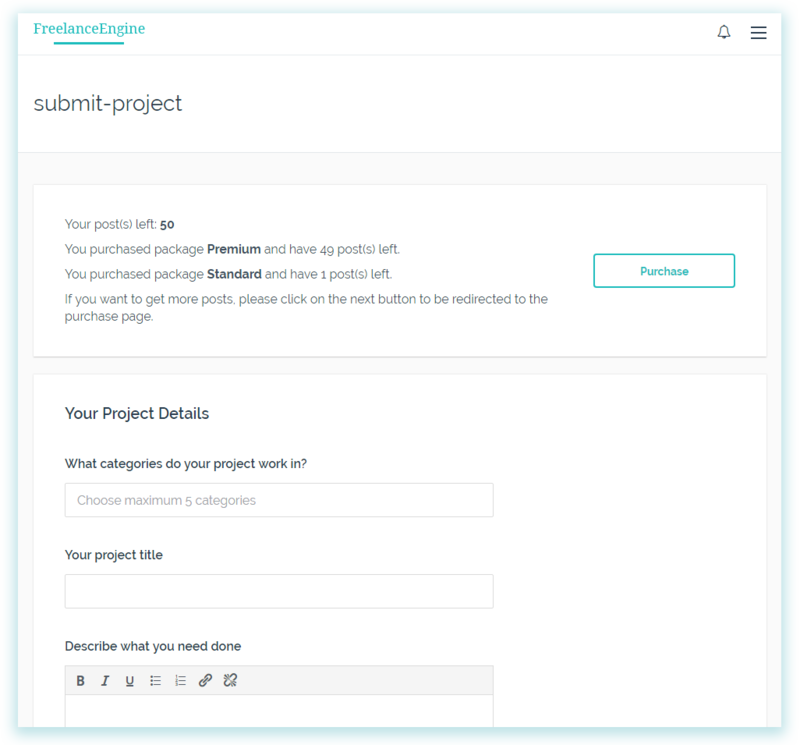 If you have any questions about FreelanceEngine 1.8, don’t hesitate to drop your comment below. We’re happy to answer them. I installed that theme few days ago but when someone sends invite to freelancer freelancer gets notification but he can’t see accept invites link etc so I just removed that theme.. I think you misunderstand the invite to bid feature. When an employer invites a freelance to bid his project. The notification is sent to freelancer to notify him, there is no link for freelancer to accept the invite. Then, the freelancer must go to this project and click on the “Bid” button. At that moment, the employer will accept the bid of freelancer. Please note that only employer can review the bid and accept a bid. Freelancer must bid on the project whether he is invited to bid or not. Hope it classifies your concern. hi,, thanks for your reply but i was talking about invite of project provider after freelancer bid. when employer finds notification of bid then he invites that freelancer then how to start project on freelancer side? As we mentioned, when an employer invites a freelancer to bid his project, a notification about this invitation is sent to the freelancer. After this invitation is sent, the invited freelancer can take a look at the project details and decide to bid it or not. If the freelancer bids on the project, the employer will receive a notification. At that time, the employer can accept the bid of this freelancer to start the project. If you want to get more information about the workflow of FreelanceEngine, please visit our docs at https://docs.google.com/document/d/14Ct2gjkuoAhgCBsEPtGlavmdUM1OYE2RQSOWLuePiwc. Hope it classified your questions. Is this automatically updating our current theme or do we have to purchase the new updated theme. You haven’t to purchase the new updated theme. Once our new version is rolled out. You’ll receive the notification, then you can either automatically or manually update as usual. Very beautiful and fluid design. what exact date in May is this going to be released. I purchased v1.7 about 3 weeks ago. I want to know if i can wait on customizing my current version till this is released. Can I easily update to this or do i have to purchase it. 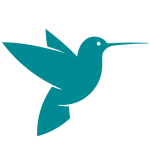 FreelanceEngine 1.8 will be rolled out before May 15, 2017. You should wait for FreelanceEngine 1.8 since the UI/UX design of this new version changes a lot. So, I think you shouldn’t customize your site until updating FreelanceEngine 1.8. 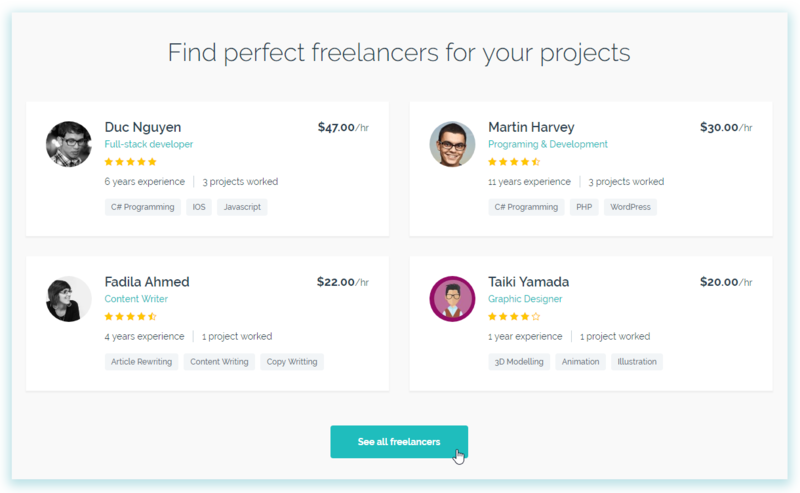 FreelanceEngine is the updated version so you haven’t to purchase it. It’s so easy for you to update as this our tutorial. These changes look good guys. Looking forward to the updates. I have tickets about switching the default user roles in sign up. Can we set the default user role ourselves in the new 1.8revision? Can you provide us more details regarding the default user role? Sorry, I haven’t totally understood your point. With the new theme coming out will we be able to just update the theme from WordPress or will the new theme have to be reinstalled? Also will the new feature have a more integrated version of payments or will it be the same and with private message will that have the function/ability to make voice or video calls or is that function not in? With the new version of FreelanceEngine, you just update the theme from WordPress as normal. You can either manually or automatically upgrade your site as this tutorial. FreelanceEngine 1.8 focuses more on UX/UI design, so we don’t conduct the new feature for payment gateway or other extensions such as the private message. Other new features will be carried out in our next versions. Also, you can visit our public roadmap for further details at https://trello.com/b/YYOQhHD5/freelanceengine-fre-roadmap-2017. Another question, will the site have the function to be a multi-language site or will a plugin still need to be installed with updating CSS? 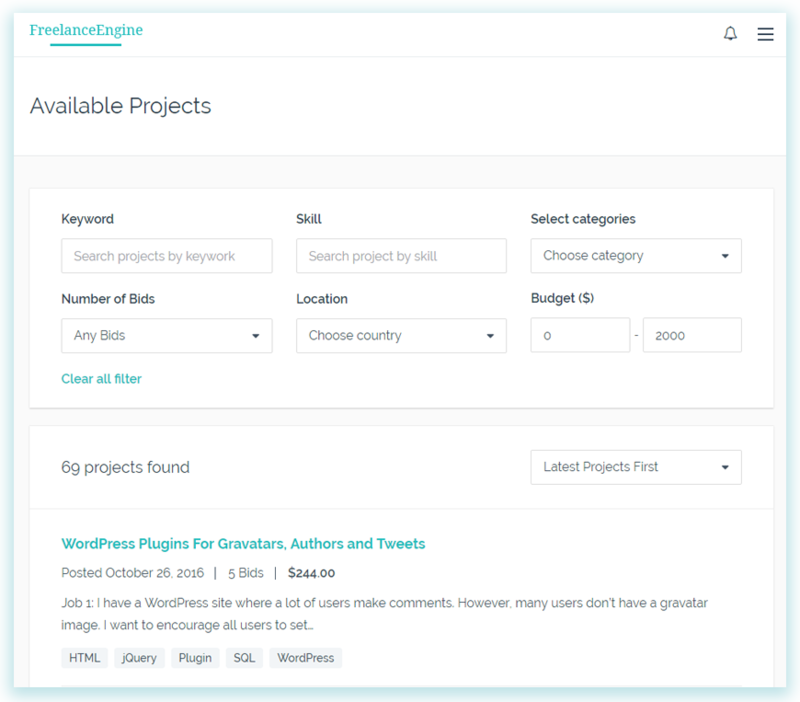 The WPML (The WordPress Multilingual Plugin), Slider Revolution, and Visual Composer won’t supported in FreelanceEngine 1.8. Looking great guys! 2 days ago I downloaded the latest version. Can you be a bit note specific about the date in May so I don’t waste time changing 1.7. Thank you for your nice words, Dan! Will new project alerts be improved to include geographical areas? In FreelanceEngine 1.8, we haven’t conducted the geographical areas, However, we added the location that displays the project detail and freelancers can easily search projects by the location from FreelanceEngine1.8. 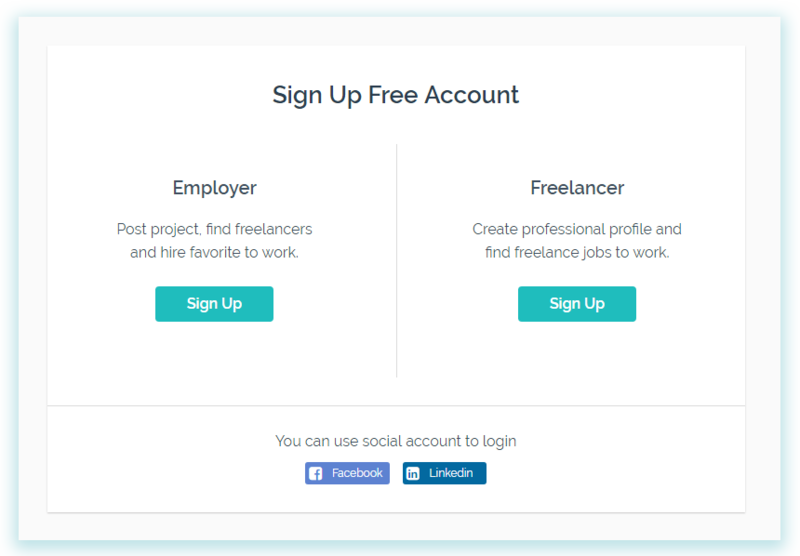 Regarding the default user role, currently the Freelanceengine set Employer as default user role in the registration page. Lot of my customer are freelancer but they registered as Employer by mistake. It will be nice if website admin can change the default user role. I have submitted a couple of tickets about this before, I was told that the information have been submitted to developer and it will be considered in new revision. But it has never been done. Hope this issue can be solved in this new revision. 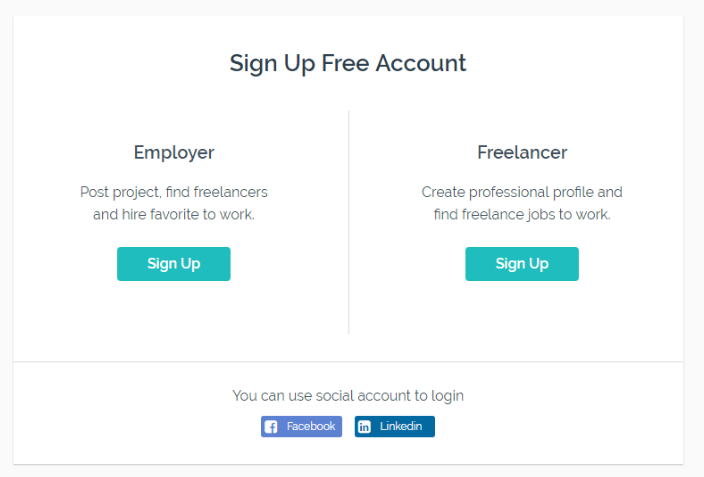 In the FreelanceEngine 1.8, we also change the UI/UX design of the new signup page that allows visitor to select either freelancer or employer role when registering: http://i.imgur.com/tjaZNiX.png. Should we stop and wait till the new version? or it’s not a problem and our translations will work also on the v1.8 version? Because we change the whole UX/UI design of FreelanceEngine in its version 1.8. Therefore, when you update your site to this latest version, all codes that you customized for your theme will be lost. Therefore, you shouldn’t customize your theme at that time. Besides, you should back up your database before updating your site to FreelanceEngine 1.8. So when exactly is going to be released so we can access? And wordpress versions i hope? Bcis i am currently working on deploying the current version for a services websites…so do i just hang for this new version? FreelanceEngine 1.8 will be rolled out before May 15, 2017, and our new updated version works well on WP 4.6+. Because our new version is changed the whole its UX/UI design, your site customization will be affected. So, you should save the code you use to customize your site and back up your database before updating your site to FreelanceEngine 1.8. Excellent news! Will I be able to translate all text to spanish? Hello what about the background homepage? Can we change it? Yes Bun Nazam. You can go to the customization section to change the banner that is displayed at the top of your homepage. Will FreelanceEngine 1.8. make project page to become private if I wish? at the moment that not possible. I will like to keep some project visible to a select group of freelancers. Have a look at this similar script. Regarding your question, this feature isn’t available in FreelanceEngine 1.8 since we focus on UX/UI design rather than the theme function. Congratulations for the new design of the theme. You explain you are planning to develop FreelanceEngine with more features and functions spreading out from now until the end of this year. Could you tell somme of the biggest features and functions you are working on? On one of the comment you also say that “The WPML (The WordPress Multilingual Plugin), Slider Revolution, and Visual Composer won’t supported in FreelanceEngine 1.8”. Can you explain this comment a bit more? We’re currently planning to develop our theme functions and we’ll conduct it from now until at the end of this year. For further detail, you can visit our public roadmap at https://trello.com/b/YYOQhHD5/freelanceengine-fre-roadmap-2017. Since we designed a new homepage in FreelanceEngine 1.8, we won’t support Slider Revolution and Visual Composer anymore. However, if you don’t want to use the new homepage, you can use the old one and use Slider Revolution & Visual Composer as before, but we don’t develop our theme integrated with these plugins. About WPML, we won’t also supported since this plugin isn’t compatible with our theme causing some minor bugs for FreelanceEngine. As a result, we don’t support WPML from FreelanceEngine 1.8. “Slider Revolution, and Visual Composer won’t supported in FreelanceEngine 1.8.” WOW guys that is a really big change! My site (hirethehomefront.org) uses Slider Revolution on a significant number of pages. When you say “not supported” do you mean you just won’t include it for new sales or that it will not work with 1.8? As we mentioned, Slider Revolution and Visual Composer won’t supported in FreelanceEngine 1.8. It means that we don’t include these plugins for the new sales. 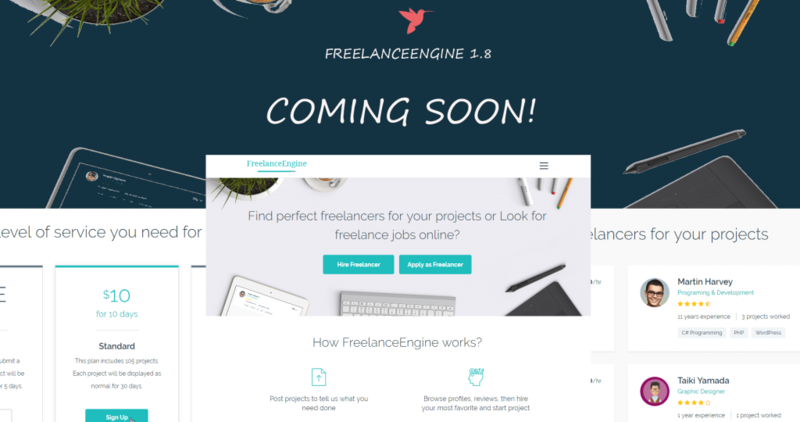 If you want to use these plugin for your site after your site updating in FreelanceEngine 1.8, please wait for our release announcement today. We will give you a detailed guide and explanation regarding FreelanceEngine 1.8. 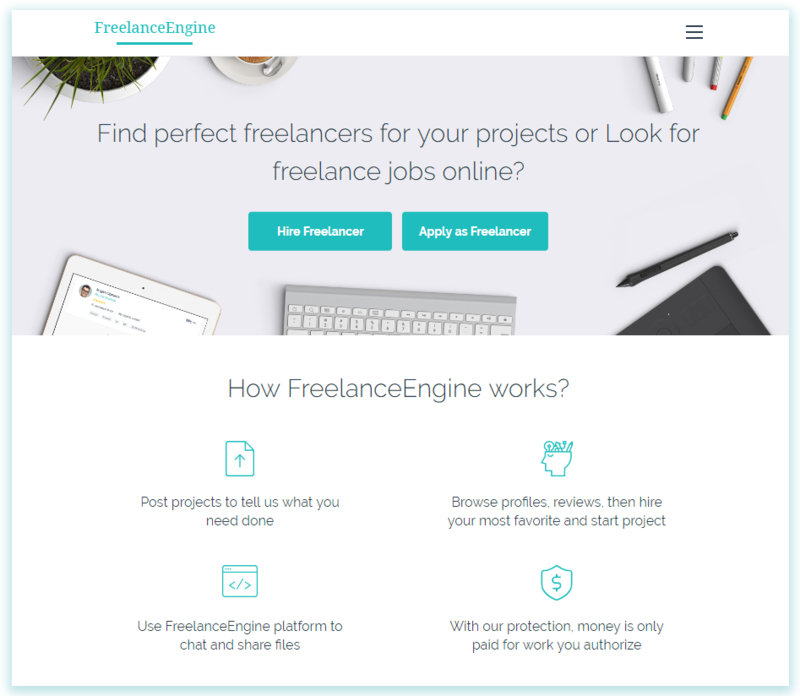 Would the freelanceengine update include payment with credit cards? Regarding your question, FreelanceEngine focuses more than UX/UI design. So, we don’t develop any features or functions in this version. so how much it would cost me to add this function as a custom work ? 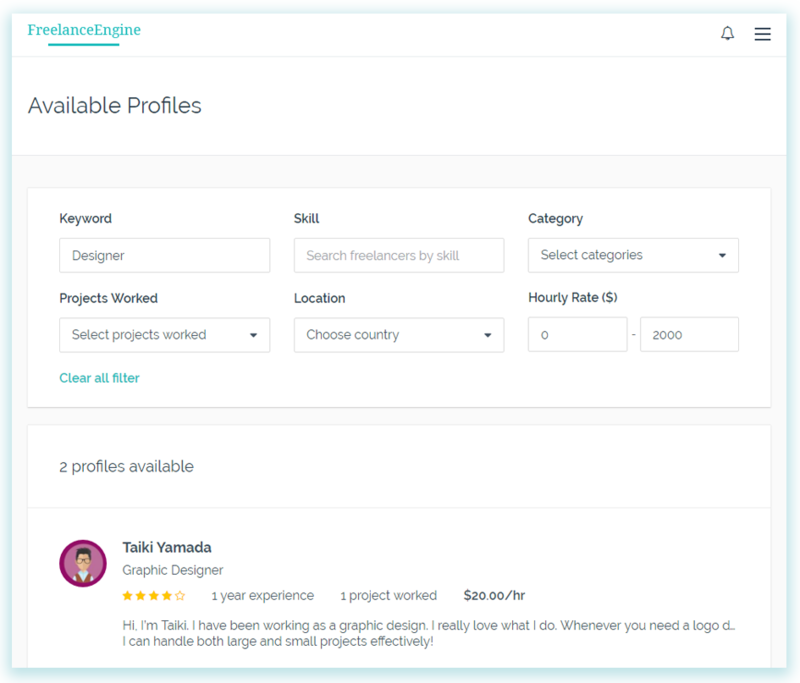 i would like to do some custom work after the update of freelanceengine. Regarding the customization, we cannot estimate the cost for you. So, you should find a freelancer/developer to customize your site and negotiate with them. Hi Any news on this? Would like to use this theme. I see on trello expected date was 5 May. I was ready to buy the theme, but it says the payment site 2checkout.com is not secure. Are you going to fix this? Could you provide us more details about the problem you mentioned involved in 2Checkout? I’m using the older version of the software. I can’t seem to be able to download the installation files for 1.8…it won’t show under my downloads (account). Regarding your question, I’ve checked your account and found that your license for FreelanceEngine was expired in 22/02/17. It means you can use FreelanceEngine for your website without any problem, but you cannot keep receiving updates and our support for it if you don’t renew your license. That’s why you cannot access to your member area to download the latest version 1.8. We sent you an email on Feb 15, 2017 related to this problem, kindly check your mailbox and reply us if you want to renew your license with 50% off of the original price. How I can add link to Signin and Signup page? and same with signup page. Please let me know how I can link them to signin and signup pages? Regarding your question, you should send us a ticket by choosing Technical Problems section at https://www.enginethemes.com/help/. Our TS will help you resolve the problem.